Conisder Sanitaire's NEW QUIET CLEAN Back Pack Vacuum, model SC412 Quite Clean is the perfect vacuum for quick cleaning in hard-to-reach places. Its lightweight design and ergonomic back harness make it easy for anyone to manage. The back vacuum is UL listed, comes with 5 ft hose 1 1/2-inch cleaning accessories and button lock aluminum wands to reach high, low, under and behind. The multipurpose floor nozzle glides smoothly on carpet and bare floors and a unique 360 degree, double angle hose inlet provides maximum comfort and versatility for the user. Additional features include a quiet 1200 Watt High Efficiency Motor and a detachable 50-foot power cord. 6.0 Dry qts Dust Capacity. Quick clean up with replaceable disposable dust bags. Easy access to filter for cleaning and replacing. Main power switch can be mounted on belt for easy on and off. 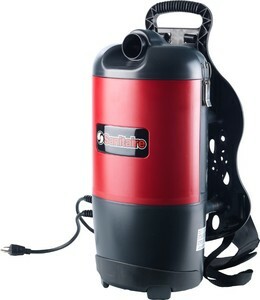 Sanitaire does not have a backpack that has a motorized power head. ProTeam and Bissell do. John Douthat, Owner & Tech.